In case you’ve never been through the launch of a Mass Effect game before, here’s how it works: about fifty trailers somehow manage to not spoil the whole thing for you, then you buy it and it’s great. We’re three for three on that so far, and Mass Effect: Andromeda doesn’t look like it’s going to be any different, quality pending. Right now you’re looking at the dedicated hub for all the trailers – find them below. For all the details on Mass Effect: Andromeda’s release date, features, multiplayer and story, see our dedicated article. We’ll update this whenever Bioware and EA put out a new trailer – expect that to be mighty common through early 2017 up to release on March 21 in the US, 23 in the EU. You’ll find whatever the latest is at the top, with a short descriptor of what’s inside, or in the Initiative section when those are released. BioWare are showing off Mass Effect: Andromeda’s optional multiplayer mode in this new video. In it, you can see the four-player co-op wave defense in action, along with some of the skills and classes available. Take a little tour in the Nomad as IGN have another exclusive look at BioWare’s upcoming RPG. This one’s all about vehicle gameplay. IGN continue their spoiler-laden look around the new galaxy with three planets from Andromeda explored. A shorter one, but there’s doubtless more to follow. This footage gives Pathfinders a tour around the Nexus. Complete with a research lab, cultural exchange and bar, it’s got everything a space traveller would want. To get Pathfinders up to speed on the seven golden worlds present in the Helius Cluster, here is a special briefing presented by the Tempest’s chief science officer. Here’s a sneak peek at the first 13 minutes of Mass Effect: Andromeda. There are no major spoilers here, it just shows Ryder waking up from cryosleep and being briefed about their mission. Watch Ryder and crew land on a planet and begin the process of making it a viable asset of the Andromeda Initiative. Join voice actor Kumail Nanjiani as he chats about his character Jarun Tann, asalarian politician with deep insecurities. Here’s some footage of Peebee’s loyalty mission. It’s cut in such a way that it’s relatively spoiler-free, so you can just get an extended look at more combat. Just like if humanity were actually going into space to meet new species, EA and BioWare are making sure they pack plenty of guns. There’s been a massive focus on combat in the latest batch of trailers, but I suppose that’s easier to sell than dynamic talky times. Anyway, it looks good and you can shoot people out of windows with a shotgun blast. …while in this second, Dormer herself shares some thoughts on Andromeda’s production values, and on sharing the Tempest with the actor who played Margaery Tyrell’s brother, Renly Baratheon, for this other GoT alumnus is voicing your engineer. Bioware run us through how Ryder’s powers and character customisation works, as well as explaining more of the progression and combat systems. Despite the title, it does not introduce squadmates or how they interact with you. Detailing weapons, guns and powers, the first gameplay series trailer shows off how you’ll take out the Kett – and any other baddies – in MEA. It’s a lot more free-flowing and dynamic than previous Mass Effect games, and looks a hell of a lot prettier. We knew about Andromeda’s pre-order bonuses already, but this short trailer gives us a closer look at them. If you ever wondered what’s the fastest way to make a terrible first impression at an alien first contact, this trailer has the answer: gold Nomad. On the plus side, it’s clear that the Krogan Vanguard will be a class in multiplayer, which is great news. A chat with Peebee’s voice actress Christine Lakin, whom you might know as Valkyrie in Rainbow Six Siege, Jane in Telltale’s The Walking Dead or Irina in Might & Magic Heroes VI. She gives plenty of insight to Peebee’s character, and this is where we learned that the bubbly Asari will be romanceable in the game. It’s your old dad. The latest Mass Effect: Andromeda trailer introduces the Pathfinder team, showing the N7-clad Ryder and his kids, who you have to choose between for your protagonist. Both the Ryder siblings are fresh off Alliance tours, one at a station outpost and the other at some Prothean ruins. No doubt their pasts will be referenced in conversation. The last human on the Pathfinder team is Cara Harper, a biotic you can bone, as seen in the New Earth trailer below. Our first look at romance and the two human companions in this trailer, plus some full Bioware action scenes, one-liners and a Krogan. The whole Milky Way galaxy looks like it’s going for a ride, too. Here’s a quick look at the Tempest, your Normandy replacement in the Andromeda galaxy. You get to see its interior for the first time, along with a bunch of nifty world-building facts. There’s also a little look at the Nomad, which is already looking like a more exciting land vehicle than the Mako. Not strictly a trailer, but we’ll accept it because Tom Taylorson and Fryda Wolff are quite funny. While not entirely serious, it is a good introduction to the people you’ll be listening to for 100 hours. Our first glimpse at actual menus, RPG systems and levelling up – as well as some extended combat and weapon selection. A lot to learn in this trailer, if you’re willing to delve deep. Hey, there it is. Other than some dodgy lip-sync – which Bioware have said is being worked on – all the alien killing, renegade prompting and nu-mako-driving looks rather good to us. N7 day 2016 finally brought a couple of biggies, including this story trailer which introduces the new villain and male Ryder. These are a tad different – the various introductory videos revealed by the in-universe Andromeda Initiative program. They offer tantilising glimpses of plot details, but won’t ever be showing traditional gameplay. The first details the Andromeda Initiative itself as an introduction to the game’s setup. An expanded version of that explains the Pathfinder (that’s you, Ryder) and why there’s so many Arks. The Nexus is shown off in the third, Andromeda’s version of the Citadel. It also explains how we’re all heading to Andromeda. Expect seven of these in all, six proper briefings and that initial video. They’ve appeared about one a month since the program started. Coming out of the Playstation Experience PS4 Pro event was the first real look at ME:Andromeda in action. It wasn’t an actual scene from the game, instead built specifically for this demo, but it had talking, walking around and alien threats, plus a dramatic cliffhanger ending. Sounds like Mass Effect to us. Edging ever close to gameplay, though not quite there yet, this was the admittedly disappointing showing during E3 2016. It gave us a first look at Peebee the Asari and continued the frustrating practice of looking at men drawing concept art. The first trailer for the game proper, with its real name and everything, shown at E3 2015. Doesn’t even feature Ryder, it’s so early. We heard nothing about the game for most of the next year. Back before it had the Andromeda moniker and was known colloquially as Mass Effect 4 by everyone except Bioware, or demanded everyone stop calling it that. They eventually gave it a real name. And some gameplay. 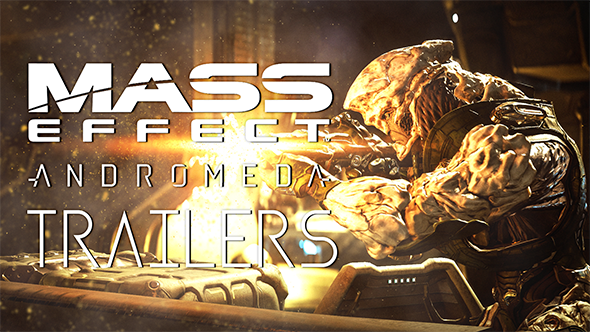 That’s all the Mass Effect trailers – so far. Check back regularly for more.